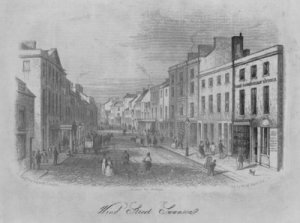 The Cambrian was the first newspaper to be published in Wales, when it rolled off the press on January 28th 1804 at its premises on Wind Street Swansea. The Cambrian was printed weekly for 126 years covering both local and national events, advertisements and social discourse in its columns. The final edition of The Cambrian appeared in March 1930 when it then merged with other local newspapers to become the Herald of Wales. The Cambrian Indexing Project was established in Swansea Central Library with the aim of providing researchers with access to the vast amount of information contained within the newspaper’s pages. The computerised index contains over a hundred thousand entries referring to people living in the former county of West Glamorgan as well as events occurring in its major towns of Swansea, Neath, and Port Talbot. The index covers the majority of the nineteenth century and is updated regularly. Amongst those who use the index are local and family historians, students and authors. The majority of the 400,000 entries on the index have been extracted from The Cambrian, although in order to provide continuity and improve access to other local newspapers some entries from The South Wales Daily Post and the Western Mail have also been included.